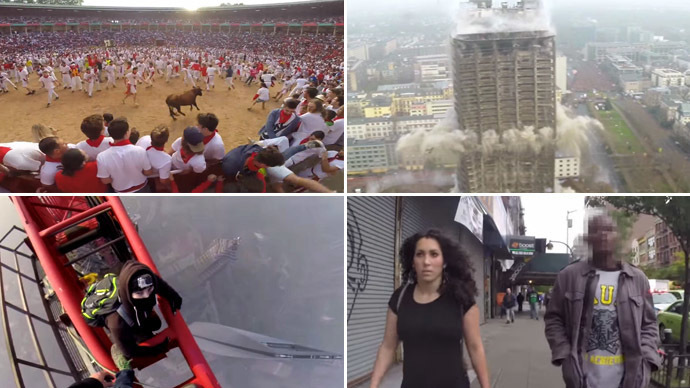 Here are the eight most immersive, newsworthy, and controversial videos of the year, taken by action cameras. Much more than just eye candy, there is a story behind each stunning digital reel. Take a rundown part of Buenos Aires, add a group of somewhat naïve tourists breezily riding their rented city bikes while wearing a GoPro and carrying expensive photo equipment, and you get one of the biggest YouTube hits of 2014. Canadians Alex Hennessy and Mike Graziano were in the process of completing their aim of visiting 195 countries, and had already been mugged in Ecuador, just weeks earlier, when a robber brandishing a gun started demanding their backpack. Whether travel-hardened or foolhardy, Hennessy played dumb, pretending not to understand the mugger’s increasingly desperate demands, almost daring him to use his pistol. After what seemed like an eternity, Hennessy’s carefree associates noticed the absence of their friend, scaring the mugger off just in time. “I’m pretty callous. No longer fazed by guns. I need them to show me bullets,” joked Graziano, who is currently recruiting several female companions to join him in his quest to become the youngest North American to visit all the world’s countries. Meanwhile, the failed mugger was identified as Gaston Aguirre, who was apprehended and released before casually giving interviews about his role in the drama to a media keen to hear his side of the story. Twenty-one-year-old Ukrainian Vitaliy Raskalov and 25-year-old Russian Vadim Makhorov have the lifestyle you wish you could have – if you didn’t get a little jittery when you climbed a ladder to change the kitchen lights. Arriving in a city anywhere in the world unannounced, the pair of self-styled urban explorers plan a heist to climb the best-secured building in the city which will allow them to capture the most spectacular photos and a requisite terrifying first-person video of them climbing – unsecured – up structures which were previously only reached by cranes and engineers. The two live off selling videos and photos of their stunts, and by working with commercial brands. Last year, the pair – whose origins from either side of the Ukrainian border have given them symbolic cachet – annoyed Egyptian authorities when they ascended to the top of the pyramids in Giza. This year, the two took advantage of the Chinese New Year, using it to get to the top of the uncompleted 632-meter Shanghai Tower. The location of their next terrifying ascent is a closely-guarded secret. Perhaps the most cinematic skyscraper video of the year was John Van Horne’s jump off the 420-meter Kuala Lumpur Tower. One of the 3,200 jumps off the building during the annual BASE jumping, his video begins as he pushes off the edge of the building and into the night sky, lit up with thousands of lights. So far, so YouTube. But, gradually we see that the parachute is aiming for a blue dot in the distance, on a landing of another tall building. As it gets closer, we realize it’s a swimming pool, and suddenly Van Horne is landing in the middle of a pool party, to wild whooping. As the camera captures him getting high-fives from admiring men, and kisses and drinks from smitten women, we feel what it’s like to be James Bond, at least for several seconds. The jump itself wasn’t a cinch either. "Fake!" is probably one of the most common YouTube shouts below any video featuring unusual events. And perhaps getting legitimate journalists, computer graphics experts, and shark scientists to write entire columns debating a 1:38 viral video, posted by someone claiming to be named Terry Tufferson, is the whole point. Was the brave Aussie who “fought off,” or rather swam away from a “shark” in any real danger, or was he just someone trying to earn money though clicks, or pave his way to a Hollywood job in special effects? This is still not public knowledge. As for the authenticity, a later video of a man running into a tornado uploaded by Tufferson removed most doubt of the genuineness of the shark evasion. For those who’d felt duped after the original, there was karmic retribution – the second video received only a fraction of the shark video's 28 million views. Hundreds of courageous runners in red scarves and white outfits dash through the streets of the Spanish town of Pamplona pursued by enormous bulls on an annual basis. The Running of the Bulls – or 'encierro' in Spanish – is part of the yearly San Fermin Festival. The traditional chase through the town's winding streets attracts a large number of people, with the highly risky run being filmed on thousands of cameras. The majority of the videos are typically shaky and blurry, with the bulls chasing the runners – or “mozos” – while they hold digital cameras and sprint at high speeds, sometimes falling to the ground. However, GoPro footage filmed in Pamplona in July gives a more comprehensive look into the adrenalin-filled chase. "Not everyone can run the encierro," the organizers of the festival warn, adding that participation requires "cool nerves, quick reflexes and a good level of physical fitness." The tradition, which dates back to the 13th century, has seen 14 fatal cases – among people, not bulls – over the past century. No one is killed in the GoPro video, but many fall within dangerous proximity to the speeding hooves. A number of people are seen being gored by the bulls. Several participants, both locals and foreigners, were injured during this year's frenzied dash; an American who co-wrote a book titled 'How to Survive the Running of the Bulls' was among them. Vongfong wasn’t the best GoPro video taken at the ISS, because it didn’t involve giddy astronauts trying to stuff a camera into a floating water bubble. NASA explained that the crew was “exploring the phenomenon of water surface tension in microgravity on the International Space Station,” rather than just delighting in being the only humans able to play with flying water droplets. The whole phenomenon was captured by a 3D camera from the outside, if anyone wants to feel extra envious of Expedition 40. The AfE tower, an unloved landmark in Frankfurt, was renowned for student sit-ins (due to the limited amount of doors, students could simply take control of the block) and for being a hulking example of 1970s Brutalist architecture. A total of 10,000 people gathered outside to watch Europe’s tallest ever demolition with explosives. The demolitionists - led by, believe it or not, celebrity explosives expert Eduard Reisch - put up a 6.6 meter fence around the perimeter to avoid damage to nearby buildings, and placed dozens of canisters inside to avoid creating a dust cloud. "It is almost 100 percent possible to blow up such a building without hurting people or neighboring buildings," Reisch claimed before the explosion. The building went down in just a few seconds, in a perfectly controlled blast. An office block will now be built in its place. The most talked about video on the list featured actress Shoshana B. Roberts walking around New York for 10 hours, while a male companion filmed her from a GoPro in his backpack. Roberts and Rob Bliss, the owners of the marketing agency behind the stunt, said the woman received 108 catcalls, which were edited into a video that has gathered over 38 million views on YouTube. The debates were endless: Is the video proof that NYC and the US as a whole are unsafe for women? Was Roberts dressed “plainly," as Bliss claimed, or in provocative tight clothing? And should that make a difference? Do greetings from strangers on the street constitute harassment? If there were catcallers of all ethnicities, as Bliss claimed, why were the men in the video almost all Latino or black? The video sparked dozens of imitations and parodies. Now you can log onto YouTube and watch hours offlamboyant homosexuals,women in hijab,muscular men, and evenPrincess Leiawalking around NYC while receiving thousands of catcalls. Whether technology gives us the chance to witness injustices that might have gone unpunished, or reduces complex problems to agenda-driven public ads, this is definitely one of the rising trends to watch out for in 2015.